Paris - La Defense: La Grande Arche de la Défense. Danish architect Otto van Spreckelsen designed the hollow cube. It's really a football field sized white office building with the middle part left open. The principal architect of the design is Rem Koolhaas of the Office for Metropolitan Architecture of the Netherlands [...] The domestic architectural design collaborator for this project, East China Architectural Design & Research Institute Co., Ltd., is an affiliate of Shanghai Xian Dai Architectural Design Group. 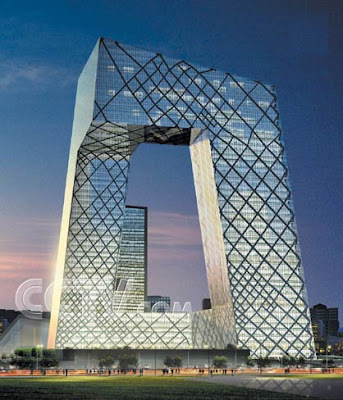 Its works included the Oriental Pearl Radio & Broadcasting Tower of Shanghai, the studio complex building of the Shanghai TV Station, the Shanghai Bookstore City and the TV tower in Jakarta, Indonesia. Saddam was murdered and it was a war crime and someone should have told Bush, Blair and Howard that they are responsible for his hanging as well.George W's "New-World-Order" started with the new "mission accomplished" fighter-pilot-draft-dodger May 2003 "victory" only 5 years ago.The 1st Gulf War was equally a one-sided slaughter his father started but would not or could not finish off, when he had the chance.The "War" is nearly over and the term hardly applies now as it is an ongoing campaign to victory according to Steve Hoadley, and the John McCain inspired surge has worked well and has not totally devastated and wrecked what is left of normal everyday Iraq apparently.Saddam may have committed gross human rights violations as a Sovereign head of state in the past decades as he did crush the Kurds uprising after the first Gulf War with President George Bush.With their Gas he was also free to commit more aggressive war-like atrocities against Iran with the blessing of the weapons manufacturers in the West who supplied the arms, when he was still in favour then.However the heavy handed way "the peace" was controlled with the lies about weapons of mass destruction and the strictly enforced sanctions like the no fly zones to protect Saddams victims from revenge, has meant that many in Iraq still suffer from the dire consequences of malnutrition and hardship caused through poverty in punishment for this ongoing seige-like mentality of ongoing conflict.The iron rule of Oligarchy may have held Iraq together for a while, but Bush was as responsible as Saddam for the awesome tragedy we witness on the evening news bulletins every night.We are often witnesses to the non counting of the dead civilian and innocent bodies and to the bloodshed and carnage and wanton destruction through suicide bombing; especially amoured cars and 4 wheel drives which are usually blown up beyond all recognition.Bhutto fell prey to this type of device unfortunately for her.However her country will be stronger for her strength and her legacy is one of returning to fight from exile and her family still carries on where she left off.For the Iraqi people the worst of all possible worlds has been realised from the illegal invasion and ongoing occupation by foreign powers.I am very critical of a form of green-zone inspired puppet-regime-politics after the illegal hanging of Saddam by Bush, Blair and Howard.They should all be tried for murder in the Hague by the U.N, alongside the Israeli Prime Minister Ehud Olmert for the same suicidal indifference to international law.Washington, London and Canberra and Tel Aviv now Wellington is no longer part of the team of allies, should have all been compelled to pursue diplomacy first and force only as a last resort, as the Twentieth Century was arguably the American or Western Allies Century, becoming the worlds only dominant economic powers.A lesson our former ANZUS partners like Australia and America should have learnt by now however from this love of conflict is that by getting too close to super-power status on your own, a once vibrant democratic society similar to our own should still not have the right to lock up political refugees from a War they started in razor wire death camps and in the desert.Otago University claims that Phil Goff told them we have spent somewhere in the region of over $100 million dollars supporting the U.S, Britain and Australia, our once traditional wartime Allies.They are remembered every year by this Government and its truly bipolar supporters like Peter Dunne and Winston Peters, across the left/right spectrum.Anzac day is an often jingoistic nationalistic fervour designed to make recent arrivals like political refugees from War unsure of their place in this their new country.The U.N. Security Council washed its hands of Iraq and left it to the U.S. and U.K. to go it alone in violation of the U.N. Charter.To put it in a broader context the U.N. became more obedient to Washington and London after the collapse of the Soviet Union and the end of the cold war.The U.S indifference of the U.N. and in particular the sage advice of the former secretary general Kofi Annan's instructions for peace led the U.S and Britain to enforce Vetoes of Security Council resolutions against War.For over half a century now America has been pursuing a "grand imperial strategy" with the aim of staking out the entire globe and this dream of hegemonic and demonic dominance has almost taken us to the edge of extinction.George W Bush is intensifying this crazy and irrational process fueled by laziness and greed as the final frontier of imperial control, and has led to a choice between the prerogatives of power and a liveable Earth or planet as American rulers are now jeopardising the future of the species with a denial of Climate change.It seems unlikely that we will have another Century dominated by the U.S and her friends, as it has further mired itself and her allies in the resource driven conflict for Oil to fuel their greedy uneconomical needs and wants like a big four wheel drive to cart the kids to and from private schools.They, and others similar to them over here want to reach out to other countries only through the gun turrets of tanks and helicopters, or even more lazy drivers of huge gas guzzling and road hogging four wheel drives.There is now a discernible sense of global energy shifting away from this desire of nearly everyone with a license to drive in "the West" alongside New Zealands departure for greener pastures elsewhere, as New Zealand prides itself on human rights, social welfare and political neutrality in the Wars of aggression for greed and sloth; and we all pride ourselves on being anti-nuclear and peaceful as well supposedly.Muslim critics of our racist governments claims to peaceful coexistence are nothing more than a pack of lies and could not be further from the truth however.Deadbeats on talkback radio are becoming addicted to stories of Anti-Muslim stereotypes and ignorance; calling them "Islamic-Fascists".This is designed to promote fear of them and the Other and to promote more racism and fear of the unknown against mostly hard working and industrious Chinese and Indians fleeing from a military coup and racial dictatorship right next door in Fiji.Foreign minister Winston Peters is now the equivalent of Australian racist Pauline Hanson who has been attacking Asians and Indians from the Pacific.Like his Australian cousins "across the ditch" as we now like to say putting distance between us and our nearest neighbours, Peters has become the "unofficial" mouthpiece as a minister outside of Cabinet for promoting a new form of ANZUS and other assorted pro American propaganda and violence in support of their Wars.Together with Australia we have sent troops to the Solomons and Tonga and East Timor but not to Fiji incidentally and what should be a show of force in retaliation for a racial dictatorship existing quite comfortably now for over 20 years right next door to us down under.They are no better than the King of Thailand or the military junta in Burma/Myanmar even further afield.Only recently we should have considered seriously the likelihood of and invaded Fiji to strike at the nationalist streak of running unwanted Fijian Indians out of their own country and into ours amongst the 300 plus Dairies in Auckland where they end up with the same drastic fate from our locals with the same strange racially superior beliefs that they are somehow invincible and the "tangata whenua".We should have done something spectacular like banning Fiji from the Sevens in Wellington at the very least by now, but banning Davu was a good start by Netball N.Z, which has now been overturned now the netball is on the typically trans-tasman focused Sky T.V.Instead we have become like a subordinate in the Asia-Pacific region to the Chinese taking orders from others to keep quiet like "yo Blair" did to Bush.That was so servile of him to do that to Bush and to the United States and not what a friend would do pointing out the error of your ways.Just like another sort of deputy sheriff in the Solomons and many hundreds of our balaclava clad police are still causing trouble whereever they go with their weapons throughout this troubled region as well.This has caused concern and disruption for the locally elected politicians in the region defending their own authority and Sovereignty.The Australians and New Zealanders overseas now say they have been invited by the King of Tonga to suppress dissent, and calls for change; but the movement for democracy has also been suppressed with our Prime Minister assisting to do the same in the South Pacific.We are performing the role of a "proxy gendarme" according to our Muslim friends and neighbours like the Grand Mufti of the South Pacific.Our ongoing support for the other War by the West in Afghanistan and the many and expensive rotations of troops in their hundreds shows that our Nationalism based Government New Zealand First, United Future, the one Progressive and Labour led Coalition still support the murderous and ongoing slaughter of Muslim or so-called Insurgent forces in the Middle East.We are not neutral in the Wars of the west at all like we like to think of ourselves as being.We no longer support our once traditional wartime Allies, but much money has been spent on "reconstruction" efforts in the region where the Taleban blew up the relics of an ancient regime.What a waste.Bill Ralston also claims when he visited Washington himself just recently he was told New Zealands efforts overseas, especially the use of the S.A.S; had been much appreciated by the Bush Administration and the Republican party in general.They had decided to end the long standing dispute over our newly independent foreign policy.Nuclear Free!